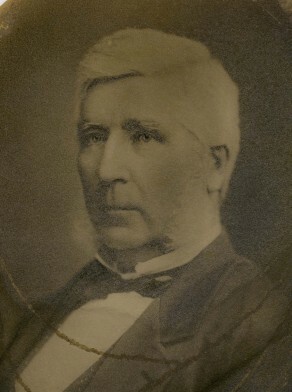 James Simpson was born at Campbelltown NSW on 18 September 1824, son of convict George Simpson and Ann nee Hayden. In 1847 he married Maria Hawthorne at Sydney. There were nine children of the marriage born between 1848 and 1863.. He died at Fairfield on 3 July 1896, aged 71 years. Maria Simpson died on 24 April 1898, aged 71 years. Initially a carpenter at Woolloomolloo, from 1859 to 1869 Simpson was publican of the Lady of the Lake on the corner of Greek and Bay streets, Glebe, within the same block as Shaftesbury Gardens. Then in 1873 he worked as a land agent at 11 Arundel Street Glebe and by 1878 was a resident storekeeper at Smithfield. He left an estate of 1,898 pounds sworn for probate purposes. Simpson urged the government to fill in Blackwattle Swamp at a meeting at the University Hotel Glebe in 1867. Three children died from fever brought on by ‘efluvia from the swamp’. He would himself fill in the swamp, he told the meeting, if the government would give him the land thus reclaimed. A public meeting in Glebe in 1862 expressed concern about distressed operatives of the manufacturing districts of Lancashire, and Simpson was part of a committee which collected funds for the distressed Lancashire operatives. A member of Glebe Council’s finance committee, Simpson was active referring matters to the Improvement Committee to report upon the expdiency and cost of forming and ballasting Glebe’s streets, and kerbing and guttering them.